Do you remember the trivia game called Six Degrees of Kevin Bacon? The premise was that any actor or actress could be linked through their roles to Kevin Bacon within six movies. 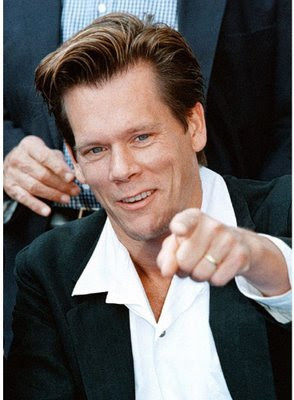 I like Kevin Bacon. I've liked him since I was a teenager and saw "Footloose." (Who among us didn't develop a little crush on Ren McCormack who only wanted to dance and was so honorable that he made Ariel wait for her first kiss.) Once, I even camped at the same campground with him and his family in Montana, although I didn't see him. I just overheard the campground owners talking about it when I went to buy toothpaste in the little convenience store. I was in "Annie" with Danny Tarasevich. Will Swenson was in "Law and Order: Criminal Intent" with Jeff Goldblum. Jeff Goldbum was in "The Switch" with Jennifer Anniston. Jennifer Anniston was in "Picture Perfect" with Kevin Bacon. So there you have it--my dubious claim to fame. Sorry, I'm not giving autographs. Oh, all right. If you really want one, I will. I NEED one! I don't know how I've lived this long without your autograph Karey! You're hilarious! Who'd have guessed my very own cousin was a celeb. That's a little too crazy of a coincidence. Please invite Kevin over and have him do the Footloose dance again? LOVE me that movie. My kids just don't get it. "Wait, they couldn't dance or listen to music? Weird." So does that mean I also am within reach of Kevin Bacon since I know you? Doing the footloose dance can make us all FEEL famous. Unfortunately for me I have never been in a real production of any kind so all I can do is name drop. Congrats Karey, you made it in under the 6 degrees and only needed 5! i guess i am only 6 degrees from him then. seriously... this was funny. and fun. we're so awesome. one thing that wasn't awesome is when i was about 10, the song was on that says 'kick off your sunday shoes'. someone was babysitting me/us (a sibling). i kicked off my sunday shoes and broke some figurine. Hey! by that logic I'm only 2 degrees away. I danced with the guy whose dancing feet at the pinball machine are in the opening credits.